Superstar Mammootty cast his vote at Ernakulam, Kadavanthra health circle office polling booth. He came in a silver colour Pajero, wearing a black t-shirt and blue jeans. When Mammootty reached there, voters in their respective queues broke their lines and rushed to have a glimpse of their favourite hero. 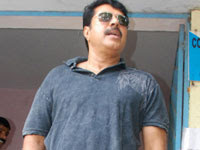 Mammootty entered the polling booth and quickly returned as he had forgotten to take his identity card. People expressed surprise whether it is compulsory for a famous figure like superstar Mammooty to have a card to cast vote. After some time his friend arrived with the identity card, he entered the booth and cast his vote. Kalabhavan Mani and Mala Aravindan cast their vote in Chalakudy and Mala. Mukesh registered his vote with his family at Kollam, while Jagadeesh came all the way from Ernakulam to cast his vote in Thiruvananthapuram. Meanwhile Dileep could not cast his vote as he was engaged in the sets.